Bliss liquid-tight A2066 is UL listed and guarantees durability and safety as the best choice for flexible conduit on the market. These flexible metal conduits can be used in a wide range of applications, including lighting, communications, air conditioning systems, fire alarm systems and so on. 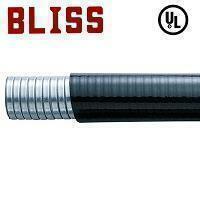 Bliss flexible conduit provide safety to your living environment, working place and construction facilities. Flexible conduit can also solve the problems found within wiring and pipeline constructions. Bliss liquid-tight flexible steel conduit type A2066 is UL listed. When assembled UL approved terminal connector shch as Bliss flexible conduit connector, Bliss flexible conduit type A2066 is applicable to NEC hazardous classified location CI DII, please see Appendix 3:Hazardous (Classified) Location and Bliss Product Performance. For the application of this product, please see Appendix 1:Flexible Conduit and Connector Application Illustration. Type A2066 also has the EMI shielding ability, for more information please see "EMI Shielding Series Introduction". Liquid-tight, high tension, flame retardant, oil and sunlight resistant. Conform to UL 360, file no. E118165.